The Montessori method and materials were developed by Dr. Maria Montessori based on her close observation of children. She saw that children are curious. They want to know what things are and how they work. They want to try new things, but they also enjoy doing their favorite things over and over again. They want to do things for themselves. Dr. Montessori became convinced that education is not something teachers do. Her great discovery was that each child educates himself through his own activity, driven by a natural desire for learning. The teacher’s job is to provide the child with all the materials and activities she needs and to remove anything that interferes with her learning. Each classroom is a carefully prepared environment that offers all the materials and activities a child needs to learn and grow. Everything in the room is designed to be attractive to the children, to fit the size of their hands and bodies, and to foster their growth and development. Children are free to move around the room as they work. Children are free to choose the work that interests them and to repeat lessons as often as they like. Materials are self-correcting, allowing the child to work through errors on her own. This process teaches children to think for themselves and not to give up when faced with frustration. The teacher is not the center of attention. Because the children are working independently, she is able to move quietly through the classroom observing each child at work, offering guidance only as needed. She will be aware when a particular child is ready to move on to the next level and will then introduce him to new materials and activities. A three-year age range within each classroom allows children to teach and learn from each other. Montessori teachers are also guides to the social and emotional development of children. Early lessons in grace and courtesy teach respect for self and others and care for the classroom and its materials. The children are responsible for returning materials to the shelves in proper order after each use, for the care of plants and animals in the classroom, for preparing snacks, and for cleaning up after each activity. A Montessori classroom is instantly recognizable. It does not look like a traditional classroom. It looks more like an office, workshop, or laboratory run by children. There is a quiet hum of busy work; children are carrying materials from shelves to tables or seated on the floor with their work spread out on mats. The teacher may not be visible at first. You will find her giving a lesson to one child or a small group of children, or she may be sitting quietly observing a child at work. 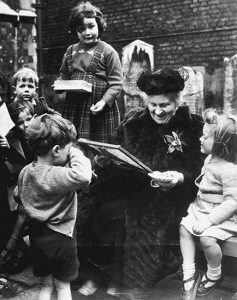 For more about how the Montessori method was developed, see the North American Montessori Teachers’ Association’s (NAMTA’s) brief biography of Maria Montessori.